Patrik Burman, who started at second on Sweden's 2010 Paralympic team before stepping up to 3rd to replace Glenn Ikonen in the playoffs, is profiled HERE. Patrick played 3rd on the 2011 Worlds team that narrowly escaped relegation, but suffered a shoulder injury in the summer and will miss this season, his place taken on the reconstituted Paralympic team likely to compete at the 2012 Worlds in Korea, by namesake Patrik Kallin. 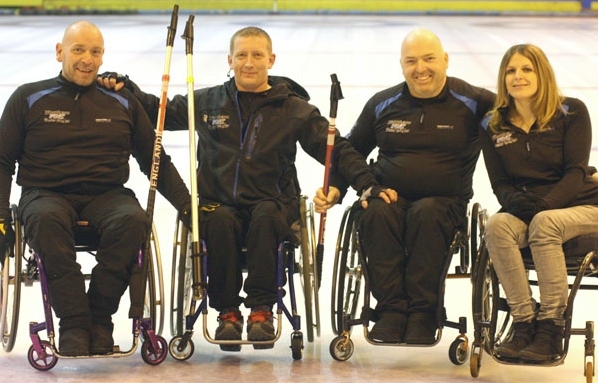 Four avid wheelchair curlers, fairly new to the ice but experienced in other sports, are looking for coaching support and sponsorship towards their goal of becoming a competitive team worthy of representing England. Stephen McGarry, Jeff Ward, Stewart Pimblett and Paula Longrigg live in the north of England, and travel to Kelso for their curling. They competed at the 2011 British Championships, finishing with a 2-2 record after a narrow 6-5 defeat by pool leader Rosemary Lenton in the final round robin draw. At present Scotland dominates British curling because they have the curling ice. Though England and Wales have competed at World events in the past, Team Scotland inevitably becomes Team Great Britain, and indeed any Paralympic qualification points that might be earned in Britain outside of Scotland are by agreement ceded to the Scots. As an ex-pat Englishman I'm cheered to see a challenge to this hegemony and I hope there are people left in England who can provide these pioneers with some much needed support. Gregor Ewan skipped his team of Jim Gault, Ian Donaldson and Gil Keith to victory at the 2011 British Wheelchair Curling Championship at The Galleon Ice Rink, Kilmarnock SCO. this weekend. Twelve teams competed in 2 pools, with crossover semi-finals for the top two in each pool. Pool A leader Rosemary Lenton gave up a steal in the 6th (final) end of her semi against Paul Webster to lose 5-3. Ewan saw off National teammate Aileen Neilson 11-2 with a series of big end steals in the other semi. He then went one better in a repeat performance, dispatching Webster 12-1 in the final. Neilson beat Lenton 6-3 to take bronze. Line scores for all the matches are presently available HERE and a digest of the final day is available HERE. Team members are HERE. Bob Cowan has some excellent photos from the event on his Skip Cottage Blog. 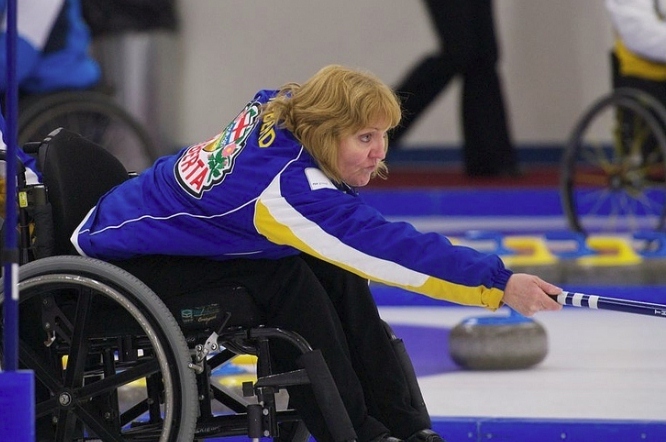 Aussie transplant Anne Hibberd, an integral part of Team Alberta for the past 6 years, is featured in the CCA's continuing promotion of wheelchair curling through their "featured athlete of the week." In addition to earning two silver medals at National championships, and recently playing in the Team Canada squad, Anne has served as president of the Calgary Wheelchair Curling Association since 2005. 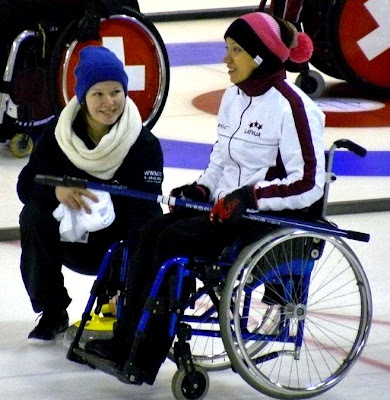 See what she has to say about her life in and out of curling, HERE. Norway, playing without skip Rune Lorentsen who did not travel, took the $400 first prize at the 7th Cathy Kerr Memorial Spiel at the RA in Ottawa. They beat Chris Sobkowicz's national champions Team Cancade 7-3 in the pool cross-over semi-final, then faced Quebec, who handed USA I their first defeat 13-3 in the other semi. The final went 9-5 to Norway; the margin, two in the 7th and a steal of two in the 8th. Team Cancade edged USA I 6-5 for 3rd place. Scores from the other cross-over games and results from all draws, plus team members, can be viewed HERE. In the recreational division Quebec visitors Lenoxville prevailed over Michel with Simpson 3rd. USA I, playing with just three members after Dave Palmer had to return home for a family emergency, went 5-0 in round robin play at the end of Day 2 of the 7th Annual Cathy Kerr Memorial Spiel at the RA in Ottawa, Ontario. They beat Ken Gregory's Bradford 6-3 and Newfoundland/Labrador 6-5. Norway also went undefeated, topping their pool after dropping only a point in yesterday's tie with Toronto. Today they inflicted Quebec's only defeat, 8-5, and finished with a 7-5 defeat of Sudbury. In the absence of skip Rune Lorentsen, who did not travel with the team but who will lead them in Korea, Jostein Stordahl has proved an effective replacement. The other members of the team have rotated positions but tomorrow will play Sissel Løchen at lead, Per Fagerhøi at 2nd and Terje Rafdal at 3rd. Chris Sobkowicz's Manitoban Team Cancade, with recent implant Mark Wherrett playing 2nd, beat Ilderton 9-3 in the morning then piled on winless Team Fraser, 18-0 after 6 ends. Their alternate, George Horning, played on the Newfoundland/Labrador team replacing a player who fell ill.
Quebec rebounded from their morning loss by beating USA II 6-5 in the afternoon. That set up top of the table cross pool match-ups of USA I vs Quebec and Norway vs Cancade at 9am, the winners playing for the $400 1st prize, and the losers playing for 3rd, at 2.15pm. In the recreational division, visiting Lennoxville (3-1) from Quebec won both their games to top the table over Michel (2-2) Wong-Sing (2-2) and Simpson (1-3). Ben Lessard's team from Quebec continued the run of form that saw them go unbeaten at last weekend's US Open, by posting a 3-0 start in Pool A on the opening day of the 7th Annual Cathy Kerr Memorial Bonspiel in Ottawa, Ontario. They beat host club organiser Bruce Cameron in the early morning (8.30am) draw 8-7 and then posted large margin wins over reigning Ontario provincial champion Chris Rees 8-1 and relative newcomers Sudbury 10-2. In Pool B USA I were also unbeaten, topping the Manitoban national champions Team Cancade 8-1, before seeing off Ottawa's Fraser 9-4 and Ilderton 12-3. The USA teams had struggled at their Open and the players have this event as a final opportunity to impress their coaches before Team USA 2012 is announced. Norway's long-time skip, Rune Lorentsen, was unable to travel with the team, so everyone moved up a position. They won two games after an opening 7-7 tie with Chris Rees. In the recreational division where all four games over the two draws ended within 2 points, Team Wong-Sing won both their games and Michel and visitors Lennoxville split while Simpson will have to wait another day. CTV's cameras were on the ice this morning talking to Ottawa's Bruce Cameron and Richard Fraser. You can see the segment HERE. Click on the November 18 wheelchair curling link. 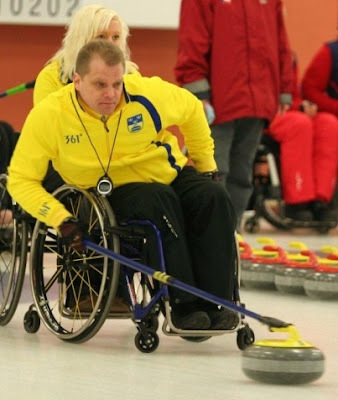 Sweden's Jalle Jungnell, who announced his retirement last season, choosing to coach rather than skip his national team at the 2011 Worlds, returned to the ice with his 2010 Paralympic bronze medal team at the 5th Annual Rolli Trophy in Bern, Switzerland this past weekend. It was Scotland however who took the top two places in the 7 team field, with Aileen Neilson skipping Angie Malone, Tom Killin and Gregor Ewan past her partner Michale McCreadie's Scotland II squad. Sweden placed 3rd. Lausanne Olympique's Eric Décorvet was the only player on the three Swiss and one Italian team to have competed in Finland last week. Ben Lessard skipped his Quebec teammates to a 7-0 sweep of the competition at the 6th Annual US Open in Utica, NY this weekend. The win, their first since the 2010 Cathy Kerr. builds on their 3rd place in Richmond earlier this month. Lessard, Carl Marquis, Johanne Daly and Denis Grenier play out of the Magog CC under coach Germain Tremblay. Their regular 2nd, Sébastien Boisvert, will rejoin the team at the Cathy Kerr. Bruce Cameron's Ottawa team (5-2) were 2nd and Ken Gregory's Bradford squad (4-3) were 3rd. The two USA teams finished a combined 5-9 and will be hoping that the rebuilt programme will make enough progress to avoid relegation at next February's Worlds. You can see some familiar faces in this video from YNN. 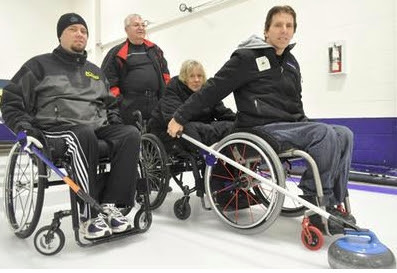 Wheelchair users in the Chase area, from Kamloops to Salmon Arm and beyond are invited to make use of the very wheelchair friendly facilities at the Chase Curling Club. 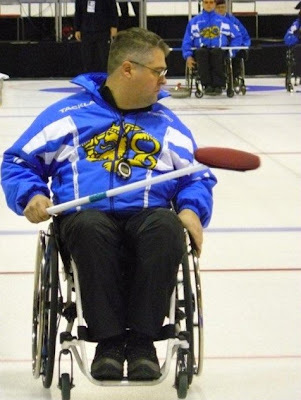 Andrew Casavant tells me he is looking to get in contact with individuals or groups catering to wheelchair users who might be interested in taking up curling, and especially stick curling, which is probably the format best suited to wheelchair play. He can be reached by email for more information. The top two teams after round robin play were also the two teams who qualified for the 2012 Worlds after the Page playoff, but it wasn't easy. Italy (7-1) got off to a fast start against Slovakia (5-3) taking 2 with hammer and then adding a steal, only to fall behind 4-3 in the 3rd. A 3 of their own saw Italy's lead restored at the break, but Slovakia tied the game with 2 in the 5th. Again Italy struck back, posting 3 in the 6th only to give two back in the 7th. With the hammer and the score 9-8 in their favour, the Italians looked to put away the nightmare of the 2010 playoff by keeping the house clean. That didn't happen. With Slovakia sitting shot, Italian skip Andrea Tabanelli missed a peel with his first stone. Slovakia drew for second shot behind a guard and Tabanelli missed his take-out attempt, giving up a steal of 2 and allowing Slovakia, in just their third year of competition, to take the first of the two Qualification slots. A surprised Slovak Skip Radoslav Duriš, said: “It’s very impressive. There were highs and lows in this game for both teams but in each end we thought we could do it. The win for us is amazing. The 3 vs. 4 game Germany faced Finland without their skip. Jens Jäger injured his had the previous evening and Caren Totzauer moved up, but gave up a 6 ender and then a steal of 4 either side of the break before losing 13-2 in six ends. That set up a match between Finland and Italy. Skip Andrea Tabanelli later professed to feeling lucky to get a second chance. He rode his luck all the way to the last rock of an extra end. Italy began with a single with hammer but immediately gave up 3 and then a steal of 1 before taking a point to go in to the break down 4-2. A steal of 1 in the 5th and a 2 with hammer in the 7th levelled the scores at 5. Early in the 8th Italy looked good to steal the game. But Markku Karjalainen made a great shot on his first stone to double out Italy's shot rocks. Tabanelli drew partially behind a centre stone to count one and Finland had a hit and stick for the win. They hit but rolled out, forcing an extra end but keeping the hammer. Both teams showed signs of mounting pressure in the final end but Markku Karjalainen again threw a double take-out with his first throw. His second take-out attempt, however, may have been slightly over-thrown. It missed and Italy could finally put 2010 behind them and celebrate the steal that qualified them for South Korea next February. Italy and Slovakia join Canada, Scotland, Norway, Russia, China, Korea, USA and Sweden at the 2012 Worlds in Chuncheon City, South Korea February 18 -25. Click HERE for full statistics, line scores and team line-ups. The event also has a Facebook page. The Idleton CC near London ON is hosting a wheelchair and visually impaired spiel on Saturday November 12. 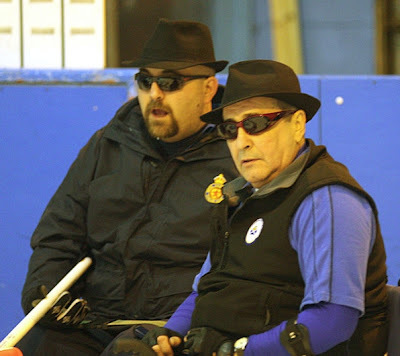 Wheelchair curling at Idleton is coached by Ernie Comerford who has seen a rapid rise in the numbers participating as well as having two of his players invited to play in Richmond BC by national team coaching staff. You can read about Saturday's event in this article. At the start of the final day of round robin play at the Worlds Qualifying Tournament in Loja, Finland, seven teams held their own fate. They just had to avoid defeat in the final two draws to join Italy in the playoffs. 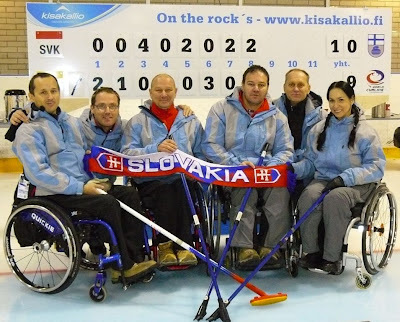 Only one, Slovakia, succeeded, beating their Czech neighbours 8-4 in the morning and Germany 7 -5 in the afternoon. 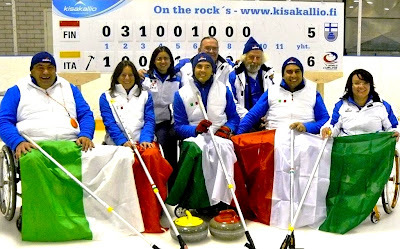 The Czechs then had to beat Italy to hope for a tie-break, but the confident Italians, leading the round robin table as they had in 2010, were in no mood to be beaten, eliminating the Czechs 7-1. Italy's morning opponents, Denmark had only to win one of their final two games to clinch a playoff spot, but lost to the leaders 8-4 and then lost to Japan 6-5 in the day's tightest game. Japan were ahead 4-1 at the break, but saw the Danes level the score with a steal of 2 in the 8th. Japan, already eliminated after suffering a 5th loss to Finland in the morning, played spoiler by taking the extra end for a 6 -5 win that pushed the Danes into a tie-break. Germany and Switzerland could not both avoid a 4th defeat as they played each other in the morning, Germany coming out on top 6-3. Switzerland salvaged a tie-break chance by beating bottom of the table Latvia 9-4 in the final draw. With Italy facing Slovakia in the Page 1 vs.2 game, there were four teams on four losses to decide who played in the Page 3 vs. 4 game, In the tie-breakers, Germany completed a miserable day for Denmark by posting a 4 in the 2nd end and holding on for a 7-5 win. Hosts Finland gave the home fans a stake in tomorrow's playoff round, beating Switzerland 7-3 after getting off to a 4-0 lead after 3 ends. The winner of tomorrow's Italy vs Slovakia game will claim the first qualification spot, while the loser will play the winner of the Germany vs. Finland game to decide who gets the second qualification place The two teams will join the eight (Canada, Scotland, Norway, Russia, China, Korea, USA and Sweden) already qualified for the 2012 Worlds next February 18-25 in South Korea. The 6th Annual U.S. Open begins this Friday in Utica, NY. Eight teams will play a full round robin with head to head records, total ends or if necessary total points as tie-breaks. There are eight teams registered. Patrick MacDonald skips the new-look Team USA I with Penny Greely, James Joseph and David Palmer. Bob Prenoveau skips USA II with Tim Kelly, JR Wynne and Meghan Lino. The American teams will be coached by Rusty Schieber. Laughie Rutt, promoted to skip after Mike Fitzgerald's move, is bringing a Nova Scotia side of Trendal Hubley-Bolivar, Debbie Earle and newcomer Keith Williams (see comments). There are three Ontario teams who will be challenging again for provincial honours this season. Ottawa's Bruce Cameron brings Doug Morris, Jamie Eddy and Christine Lavallee. Branford's (ON) Ken Gregory skips Collinda Joseph, Frank Cannarella and Jim Primervera. Toronto's Chris Rees leads Carl Bax, Alec Denys and Shauna Petrie. Benoit Lessard's Quebec team includes Carl Marquis, Sébastien Boisvert and Johanne Daly. Ontarian Katie Katie Paialunga is in charge of a mixed Canadian/American squad with Jimmy Kenner, David Sawyer and Pam Wilson. With just two more draws to play, eight of the nine teams at the 2011 Worlds Qualifying Tournament in Lohja, Finland, are still in with a chance of making the playoff. The one certainty: Italy with just one loss after 7 Draws, is guaranteed a berth. Italy's only defeat was to Japan in the morning draw. Japan, Vancouver Paralympians, lost their opening 3 games but their narrow win over table-toppers Italy was their second. Down 5-2 after 3 ends they stole the next 3 points to inch ahead, but gave up a single in the 8th to see the score tied at 6. They then took 2 with hammer in the first extra end of the event to post an 8-6 win. Unfortunately for the Japanese they were unable to maintain momentum, giving up an 8th end 2 to the Czechs in a 5-4 loss this afternoon. Four losses may still qualify for the playoffs as tomorrow's draws pit Germany and Switzerland, and the Czechs and Slovakia, each with 3 losses, against each other. The host Finns, coming off a run of 3 consecutive victories, fell to Slovakia in the morning draw, tying the game at 6 with a 2 in the 8th, but unable to prevent Slovakia taking the winning point in the extra. Another narrow loss, 6-5 to Italy this afternoon drops Finland down the table with 4 losses, needing help to get to the playoffs. Slovakia and Latvia, the least experienced of the competing sides, played a very tight game in the afternoon draw. Latvia went ahead on two double steals, but surrendered the last 4 points to lose 6-5, and drop out of contention. Slovakia moved to 3-3 and hold their fate in their own hands. Germany, who had started so brightly, lost their only game today 9-4 to the Danes who then went on to edge the Swiss 6-5 this afternoon. The Danes leapfrogged Germany and Switzerland in the table and with the four teams below them playing each other tomorrow, need just one win tomorrow to clinch a playoff spot; against either Italy or Japan. Click HERE for full statistics, line scores and team line-ups.2 The event also has a Facebook page. As play began on Day 3 of the Worlds Qualifying Tournament in Lohja, Finland, three teams were unbeaten. By the end of Draw 5 just one had a perfect record: Germany and Switzerland both losing to Italy. Italian coach Giulio Regli was delighted with his team’s performance. Remembering that the Italian team had faltered after finding themselves in this position only a year ago, he cautioned that there were still four games of the round-robin to go. "The team had to keep focused," Regli said. Switzerland were first to face the new leaders, and nosed ahead 3-2 on a steal of 2 after the mid-game break. Italy came back to steal 2 in the 7th, and sealed the win 5-3 with a final stolen point in the 8th. Italy then faced Germany, who had lost to Finland 7-4 this morning, after allowing 4 stolen points. They also may have lost some confidence as they surrendered seven more stolen points to Italy in an 11-1 loss. Switzerland, like Germany, failed to recover from their morning defeat, allowing the Finns to grab an 8 -6 win with 3 in the 8th. Per Christenson, Denmark's very experienced (and ex-Norway) coach, may have had some tough words for his under-performing national squad; whatever was or was not said, the Danes came out fighting today, blowing away the Czechs 13-5, and Latvia 15 -3. Rookies Latvia had earlier disposed of Japan 10 - 6, stealing the game's final 5 points. Paralympics skip Yoji Nakajima's team may be feeling the absence of preparation occasioned by the series of natural disasters that hit his homeland this year, though Japan did regroup to post their first win, 9-3 over Slovakia in Draw 5. Japan controlled that game with some great set up shots from the front end. Here's an observer's description of some fine play in the 3rd end that resulted in a steal of 2. Japan and Slovakia each had a stone in the 4ft, both well hidden behind guards but Slovakia had other counting stones in the house, and the hammer. Skip Yoji decided to play a hit and roll off a stone in the 12ft. to attempt to remove or make sure of the stealing point. The first two ends had been decided on a measure for the point. He made it perfectly, pushing the Slovakian counter out of the 4ft, and sitting 2 buried. Radoslav Duriš attempted a raise but was unable to outcount Japan's stones, giving up a steal of 2. Italy are a Cinderella team. They dropped into the qualifying pool by losing in a 5 way relegation tie-break at the 2009 Worlds, and last year in this event, made the 1 vs. 2 game before losing to both China and Russia. Their two-time Paralympics skip, Andrea Tabanelli, had to leave before play began last year, but after an opening bye, has steered his team to two wins on Day 2, 9-2 over Slovakia and 10-4 over Latvia. A very experienced neutral observer reports: "Latvia tied Italy after 5 ends but missed their opportunities to pressure Italy when it mattered. Their lack of strategic understanding often let Italy off the hook. Latvia missed opportunities to score a big end on numerous errors." A tough assessment of a rookie team, but probably more useful to them than the usual anodyne public relations coach-speak if the team is serious about competing at the world level. Germany and Switzerland also posted two wins. Germany beat newcomers Latvia 9-5 and were gracious in post game remarks. "We were really surprised by how strong a team Latvia was," said skip Jens Jäger. "They are very precise and good players and have clearly very good team spirit. 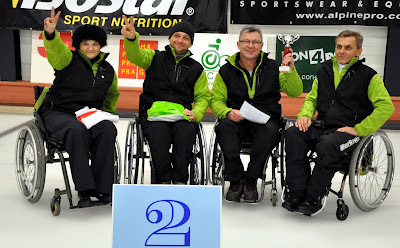 It is always a great feeling when the wheelchair curling family grows and grows." Germany blanked Japan 12-0 in the afternoon draw. Co-leaders Switzerland stole their way to an early 7-2 lead against the Czechs in Draw 2 before hanging on for a 7-6 victory. They repeated the pattern against Slovakia in Draw 4, leading 7-0 after two ends before cementing a 10-6 win with 2 in the 8th. 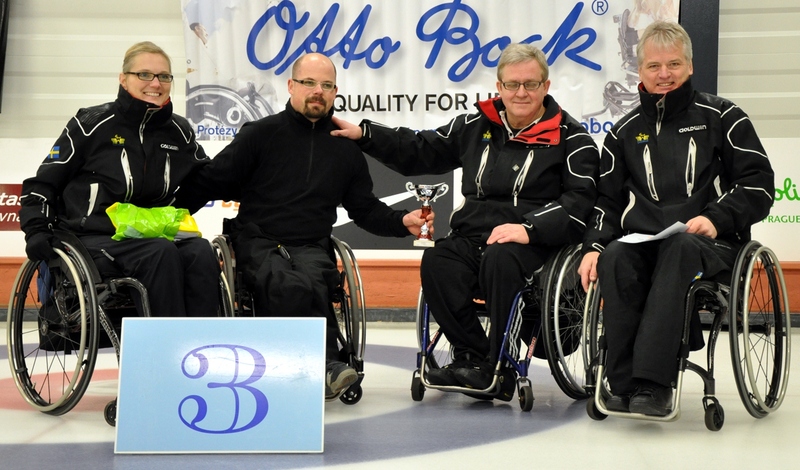 Hosts Finland posted their first win with a 5-ender and a 4-ender in a 14-1 rout of Denmark. The Finns shot an impressive 67% as a team. "It was like having a different team on the ice," said lead Tuomo Aarnikka. "We had a great start to the game. We stole five points in the second end and after that we managed to keep the game simple for us and the opposition was the one who had to keep taking the risks." The Finns were unable to maintain momentum, however, surrendering 6 steals in an 8-1 loss to the Czech Republic in Draw 3. Click HERE for full statistics, line scores and team line-ups. The World Wheelchair Curling Qualifying Tournament began today in Lohja, Finland, with nine teams competing for the final two places in the ten team 2012 World Championship in South Korea next February. Manfred Bollinger, the tournament's most experienced skip, edged his team to a 7-6 win over Japan in the opening draw. Team Japan had interrupted their Qualifier training camp to compete in the Friendship league in Hokkaido, Japan, at the end of October (where they finished bottom of the table) and with Japanese curling centred in the north of the country so badly affected by the earthquake, tsunami and its repercussions, had not had the easiest of preparations. So holding the Swiss was an encouraging result for their experienced skip Yoji Nakajima and his rookie squad. The good times were rolling again for Germany, whose skip Jens Jäger had been alarmed at my previous description of ebullient. (It had somehow become mangled in translation.) They beat the Czechs 7-4. Team Germany has a new coach (Bernd Weiser) and traveling team official Petra Schlitt professing general happiness with everything, adding: "This new group has great team spirit, and more than anything else, they want to keep the playing fun for everyone." Those of us who fondly remember their traveling supporters singing in the stands at the 2009 Worlds, hope the fun lasts the week. Hosts Finland were feeling confident before their opener against Latvia. Their skip, Vessa Hellman, said: "Practice went well and the ice feels quite good. The stones are quite a lot less swingy than last year, but they give us a good amount of curl." Unfortunately for the home fans, the Finns lost to Latvia 3-7. It was Latvia's first win at this level. "Playing in Scotland last month was good preparation," an excited vice-skip Ojars Briedis said. Slovakia, also relative newcomers to the sport at the World level, beat Denmark 11-4 in the remaining match, while Italy had a bye. Rock moving and time-keeping duties are being performed by student volunteers led by Jari Moberg "The students are extremely active in helping out in the tournament. It serves as good practice for them in how to organise and help out in sporting events and thus it is a useful experience for them also in their studies. The fact that it is an international event is always a nice addition because the students get a chance to use English." Draw 2 begins at 10.30 local time. Tournament organizers plan live webcast coverage of some games. The draw and game schedule can be found HERE. Results will be posted HERE. Canada I continued their cruise through the field on the third day of the Richmond International, stealing four ends against USA in the morning before allowing a two in the 6th and final end of a 10-2 win. In the afternoon they beat BC 9-2, padding the score with a steal of 4 in the 7th; the only game of the eight played past the 6th end. Quebec, lying 2nd in the table at start of play, started strong against Alberta, stealing 3 in the 1st, the winning margin of the 7-4 result. In the afternoon they met Manitoba's Cancade team and lost 6-4. Chris Sobkowicz's side had earlier beaten Canada II 7-2 and their double put them in second place at the end of play. Alberta slumped to a second defeat, losing to Canada II 7-6 in a game where multiple points were scored 5 of the 6 ends. The pick-up team representing the RCD hosts took another beating in the morning 12-0 defeat by BC, but regrouped in the afternoon though still losing 5-4 to USA on a stolen final point. Canada I were caught napping with an 8-1 lead allowing Chris Sobkowicz's Manitoban Cacade team to post a 4 in the 6th end. They awoke to post a 4 of their own and complete a 12-5 victory in the morning draw. They posted another 12 in the afternoon, allowing Quebec just a single point in seven ends: Quebec's first defeat after their morning 6-1 defeat of BC. Canada II have settled on an unusual line-up with Mark Ideson skipping from lead, in front of trendal Hubley-Bolivar, Darlene Jackman and Mike Munro. They posted their first win, 5-4 over USA in 6 ends in the morning draw before whitewashing the RCD host team 11-0 in Draw 4. RCD could be forgiven if they felt a little shell-shocked having been hammered 13-0 in just 3 ends by Alberta in the morning. USA stole 2 in the 7th and final end in a 6-4 win over Bruno Yizek's Alberta and BC suffered their second loss of the day - 9-3 to Manitoba's Cancade. The World Wheelchair Curling Qualifying Tournament begins Saturday November 5th at the Kisakallio Sports Institute in Lohja, Finland, site of last year's event. Nine teams will compete: Czech Republic, Denmark, Finland, Germany, Italy, Japan, Latvia, Slovakia and Switzerland. They will play a full round robin, the top four teams entering a Page playoff on Thursday November 10. The top two finishers join the top eight from the 2011 World Championships, and will compete at the 2012 Worlds in Chuncheon City, South Korea next February 18-25 for Sochi Paralympics qualifying points. 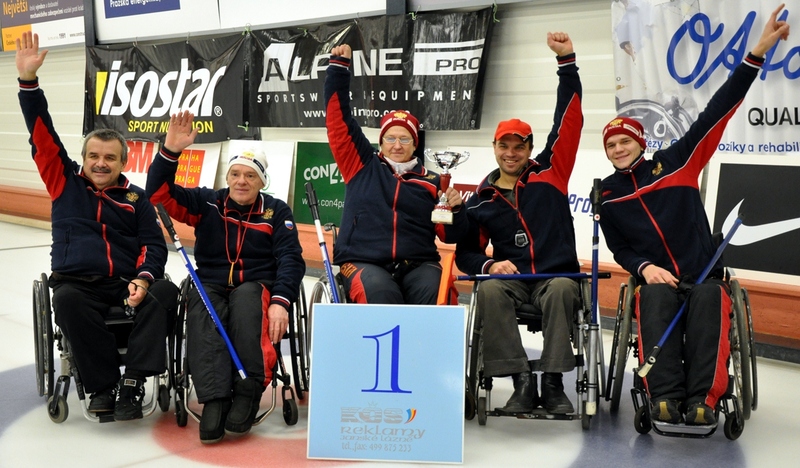 Competition between the top teams is likely to be especially tough this year as Germany, Italy, Japan and Switzerland all competed at the Vancouver Paralympics, while the Czechs have the experience of hosting the 2011 Worlds. There was a great deal of drama surrounding team Germany post Vancouver, with ebullient skip Jens Jäger shown the door after failing to build on his bronze medal performance at the 2009 Worlds. Unfortunately for Germany, Jäger's successor and ex-3rd, Marcus Sieger, was unable to avoid relegation in 2011 leading to Jäger's return to the national team. Jäger has been traveling to European spiels with his own team, the Mainhattan Ice Wheelers, with mixed success, but arrives in Finland with a new coach as a favourite to gain at least a playoff spot. No-one in Lohja has more experience than Swiss skip Manfred Bollinger, who impressed international coaches at the recent Kinross spiel where Switzerland defeated Canada en route to the final. 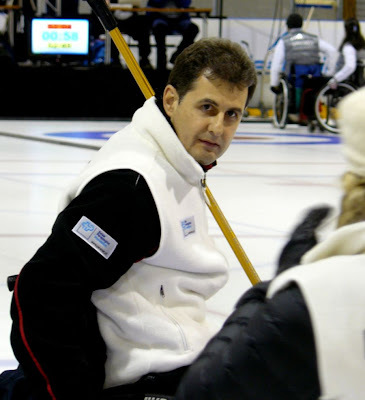 The other skips with Paralympic experience are Italy's Andrea Tabanelli who skipped the host side in Torino (2006), Denmark's Kenneth Ørbaekalso, also in Torino and Japan's Yoji Nakajima in Vancouver. In a continuing trend, 8 of the 9 teams list two female members while the other, Slovakia, travel with just a four person team. Hosts Finland are still looking for their first Worlds appearance. Radek Musilek returns to skip the Czech’s after their 10th place finish on home soil at the 2011 Worlds which sent them back to the qualification event. Latvia, skipped by Aleksandrs Dimbovkis, are competing at the international level for just the second year. Slovakia’s Radoslav Duriš and his team hope it will be third time lucky after finishing 6th last year. Tournament organizers plan live webcast coverage of some games. 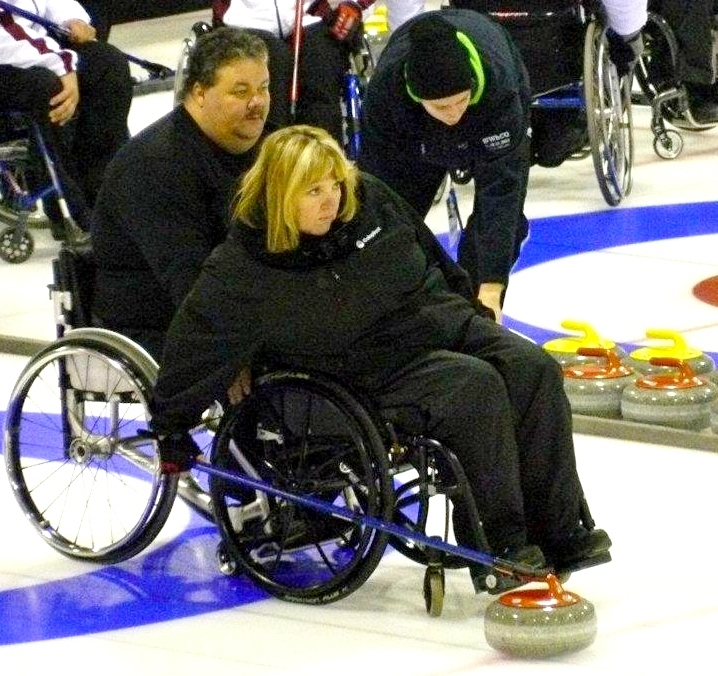 The first of four days of very competitive wheelchair curling began this morning at the Richmond CC as 8 teams started a full round robin to decide who will playoff for the $1,000 1st prize next Saturday. 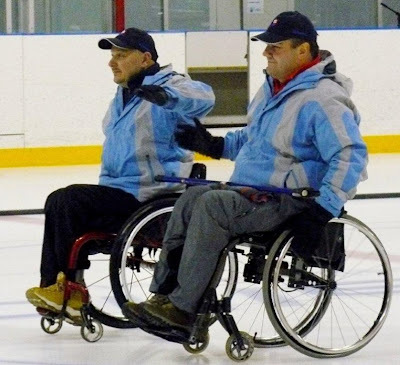 The event, sponsored by the Richmond Committee For Disability (RCD) saw Canada bring their World Champion team, as well as a neophyte Canada II team, while BC, Alberta, Quebec and Manitoba (Cancade) all fielded strong established teams with lots of competitive experience. USA featured only one player from 2010, skip Patrick MacDonald, while a mixture of players from Richmond and Portland (OR) represented the RCD hosts. Canada I crushed Canada II in the opening draw and more significantly took out Bruno Yizek's Alberta 9-3 in Draw II. Gary Cormack's BC were edged 6-3 by Alberta in the opener but rebounded to hand Canada II their second loss, 9-5 in the afternoon. Quebec handled USA 5-1 and blanked RCD 9-0, while Chris Sobkowicz's Cancade team also blanked RCD but were then beaten by USA, 7-4 in Draw 2. Play was generally slow, with most games ending in 6 ends, a couple managing just 5, and only one game lasting 7 ends. Manfred Bollinger skipped his national team to a decisive win at the 4th Annual Wetzikon Invitational in Zurich, Switzerland October 22-23. A ten team field often used as a World's Qualifying warm-up, this year attracted Italy, the Czech Republic and Team Germany, skipped once again by Jens jager, back from the wilderness and with a new coach after Germany's failure at the 2011 Worlds.